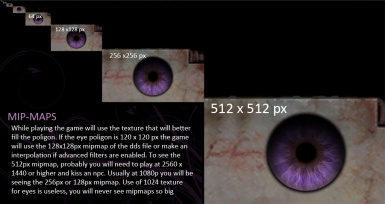 For the record, I do love what this mod does to the eyes. However, it makes them a bit too light for my tastes (and I'm not sure if that's directly due to the mod or due to my mod arrangement, my computer, etc). Below is a link to my conversion to a medium-resolution version (256). The default one here is 512, and the low-res one is a tiny 128, which is too small unless your PC is just total crap and can't handle anything else. I split the difference with this version. Feel free to just add it to the downloads area. This took about 10 min. in a graphics converter (mostly just checking for which ones have no alpha and thus can be DTX1 encoding). Why to the vamp eyes still glow in the dark? is there a way to make them not to glow ? 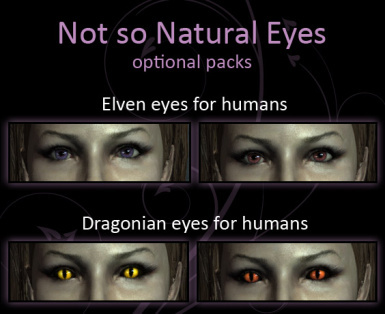 Love the mod, but I feel I should point that whilst in most settings it doesn't make sense, TES is one of the few were blue eyes on vampires makes sense, due to their association with Molag Bal and Coldharbour. 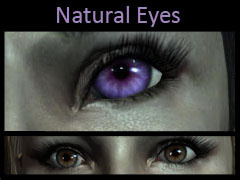 Look at the second screen shot... those are real eyes (in case you didn't know), which is what these eyes are based on. Many thanks! 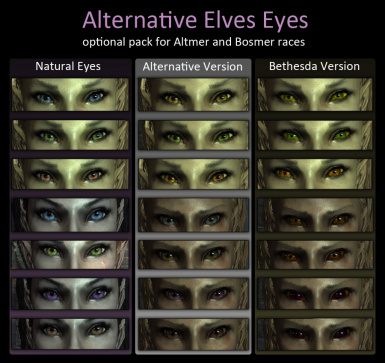 also is it player only eyes? 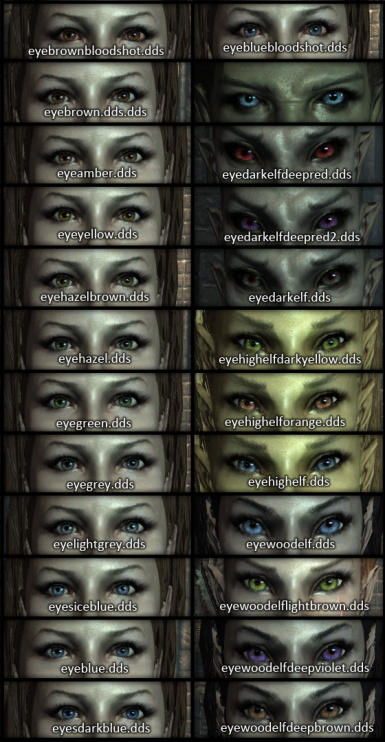 Hi, best eyes mod! I'm using it for some times now, love it. 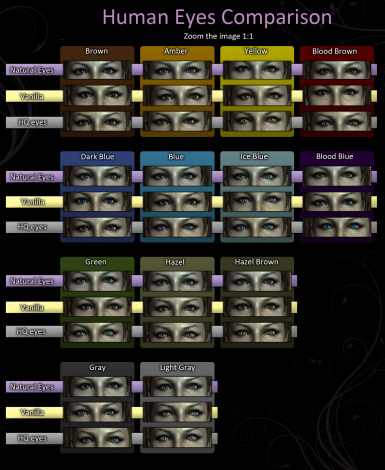 But I have some buggy textures with my dark elf vampire. There some kind of shiny and ugly white area right under the eyes. It's not really visible with torch or fire light, but mostly when I'm outside with "natural" light. Could it be a conflit with Xenius character enhancement ? 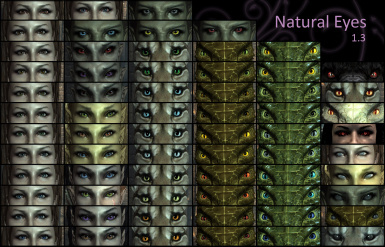 I've installed Natural Eyes in second and let it replace all the eyes textures from XCE.